Because of your injury, doctors have asked that you remain no-weight-bearing on the affected leg for a time to allow it to heal. 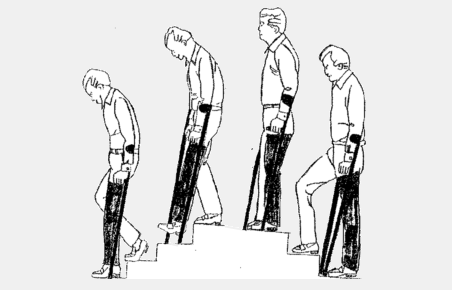 This means that you cannot take any body weight through that leg, and will need to hop, with the support of a mobility aid. It's very important to follow this advice, as putting any weight on your leg can mean you don't recover well. You may even need another operation to fix problems caused by putting weight on your leg too soon. The physiotherapist will help you to move safely and will advise you about how this will affect your lifestyle. At first, it is important for you to raise (elevate) your leg to control swelling, decrease pain, and encourage wound healing. This can be done lying on a bed, couch, or chair with your leg raised. Make sure that you take the stairs slowly. If you feel nervous, have someone stand close by. Remember that the crutches always stay with the sore leg. To make sure you heal as well as possible, it's important to keep your leg muscles strong while you are no-weight-bearing. This is so that when your doctors tell you to begin weight bearing, your muscles are ready and can adjust quickly. Please do these exercises four times day, repeating each exercise 10 times. These exercises may be a bit uncomfortable, but if you get any specific pain, you should stop the exercise. As your injury heals the doctors will let you know when you can put weight on your leg again. Please ask the staff at the clinic for advice about these changes. The medical staff may refer you to physiotherapy to help with your rehabilitation. If you have any problems with getting full movement back, difficulty with walking, running, cycling, or on-going weakness, then physiotherapy will help. If you feel you would benefit from physiotherapy make an appointment to see a physiotherapist. You don't need a referral to see a private physiotherapist in the community. However, you will need a doctor's referral for treatment at the Christchurch Hospital Physiotherapy Department. If you see a hospital physiotherapist, any equipment they provide is supplied for six weeks. After this ACC is responsible for providing any necessary equipment. Contact your ACC case manager if you need equipment after the first six weeks. Do you need a wheelchair or scooter? Wheelchairs are also available in all shopping malls, for your use while shopping. Check at the mall's information service desk. Forms are available as needed from the Disabled Person's Centre, 314 Worcester St, Christchurch, (03) 366-6189. Your GP needs to apply and sign for these. Written by Physiotherapy Department, Christchurch Hospital. Adapted by HealthInfo clinical advisers. Last reviewed January 2017.